The John Chambers keynote this year was on the Monday of the event where it is normally on the Tuesday. The pre-keynote entertainment was cool – people dancing to some EDM type music – was really enjoyable. They had dancers all over the auditorium and was some great entertainment while we waited for John Chambers to take the stage. Once John took the stage, he knows how to command an audience and keep our attention. I was able to find a copy of the slide-deck that was used for his presentation, it is worth a look if you have a few moments. If you want to see a highlight of some of the Keynote, Cisco Live has made a video available here for you to watch. It is about 2 minutes in length, so it is quick. If you want to watch the entire keynote, you can head over to Cisco Live Online here – KEYNOTE You will need an account, but they are free- so go ahead and sign up and enjoy all the benefits! One of the nice things about being Cisco Certified (CCNA, NP, IE, DE, etc) is that there is a Certification Lounge in WoS. This is a great place to grab some snacks, drinks, and hang out with others. I spent some time in this area talking to new and old acquaintances as well as grabbing a water from time to time. I will also admit that the CCIE Ribbon line moved rather well this year. It seems as though Cisco was prepared for the amount of CCIE’s that are at this event compared to other years. World of Solutions was a blast this year! Lots of great vendors and information to go around. I am not a swag person, so I cannot report on that – but I did visit some vendor booths and got some good information. One product that impressed me was Statseeker. Not only because they had been giving away a Boss Mustang, but just because the product sounds really good. If you can, check them out – they have not sponsored me or this post, just had a product that sounded good. I did receive a demo copy of the software to run at home -just need to make the time to set it up and see how it works. One of the things that I look forward to most is the CCIE/DE NetVet reception. 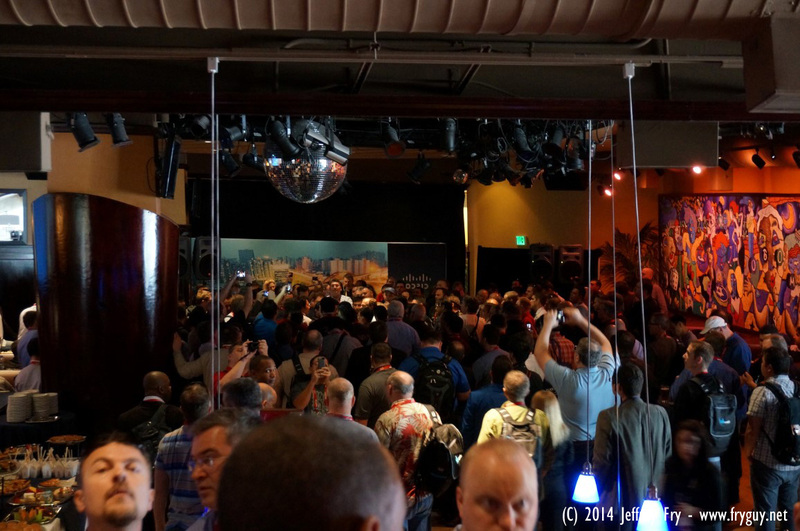 This year the reception was held at Jillian’s Restaurant just outside the Moscone Center. I have to say, we packed that place! I do not know how many CCIE/DE NetVets there are now, but the numbers are growing! I remember when I first achieved CCIE NetVet status there was about 40 of us at the most, now I think we are well over a hundred. This did cause some food delivery problems, but those got sorted out when they setup another table area in another room as well as started to walk around with the food. I just hope next year we have more space – or go back to a reception type setup in the Keynote hall. That worked well the other year, there was plenty of space and it was easy to mingle. Below is a picture of when Chambers was addressing the NetVets, as you can see – it was packed! The Customer Appreciation even this year was just AWESOME – Lenny Kravitz and Imagine Dragons rocked the AT&T park! The Cisco Champions and, for the 4th year in a row, Social Media Influencers had access to a special tweet-up area where you could see the event. It was a nice time and we had some great seats. 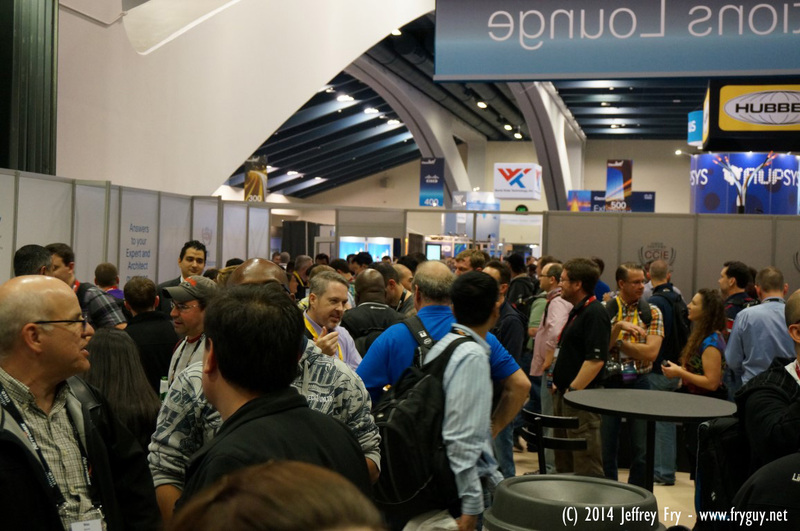 It is a great “thank you” for participating and championing both Cisco and Cisco Live. Below is an album with some of the pictures from the event. My favorites are the fireworks! Finally, I am wondering if this was John Chambers final Cisco Live as CEO of Cisco. The way that he ended the Keynote on Monday felt like it was a ending of an era and not a continuation of one. In all the years and keynotes I have seen, I have never seen him end one with a dance and walking off the stage wearing shades to Bobby Brown’s My Prerogative. Below is a quick animated .gif of him dancing and waving goodbye to everyone just before he walked off stage. Nothing officially has been said, but I think that the indications are there. From his selling of 2.2 million shares in Feb 2014 ( Network World ) to an article that dates from September 2012 on Business Insider where it talks about a two to four year timeline for his retirement. I just hope that if he does retire he continues to be Chairman of the Board for a few years, like how it happened when John Morgridge retired. I wonder who his successor will be, my bets are on Rob Lloyd – just a hunch though. Also, I was able to capture this seemingly poignant picture of Mr Chambers when he was sitting on stage taking things in. This picture was taken when a video was running during the keynote, it is a nice shot of him just taking things in and relaxing. That is a wrap for Cisco Live 2014! Quick note: I did sit the 8-hour CCDE Techtorial on Sunday and will do a separate post on that when time allows. Also noticed I did not cover Social Media – will do that in a new post.